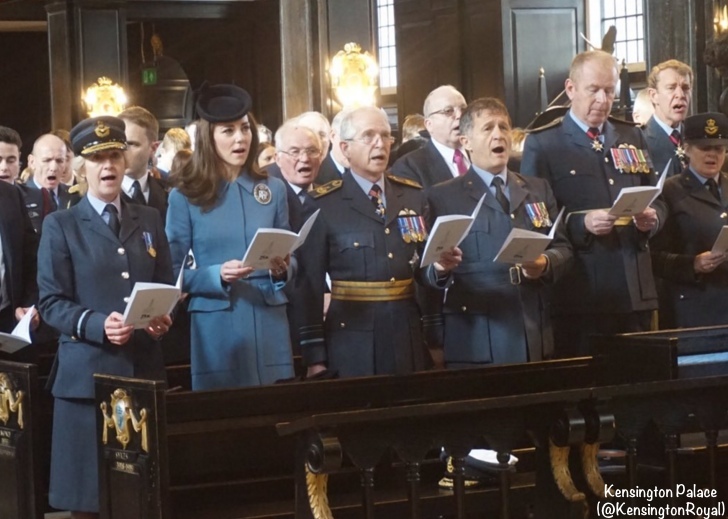 Kate wore familiar pieces to this morning’s church service honoring the 75th anniversary of the Royal Air Force Cadets. The scene outside St. Clement Danes church in Westminster, where the service was held. St. Clement Danes is the Central Church of the Royal Air Force. 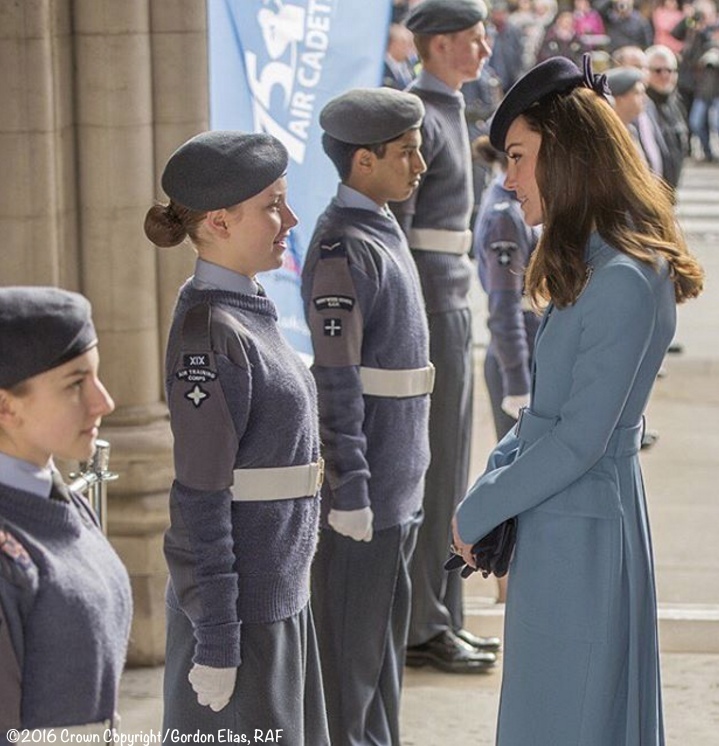 The Duchess is only the third member of the Royal family to represent the RAF Air Cadets; she follows HRH The Duke of Edinburgh and, before him, HM King George VI. Below, taking the salute from Air Commodore Dawn McCafferty. 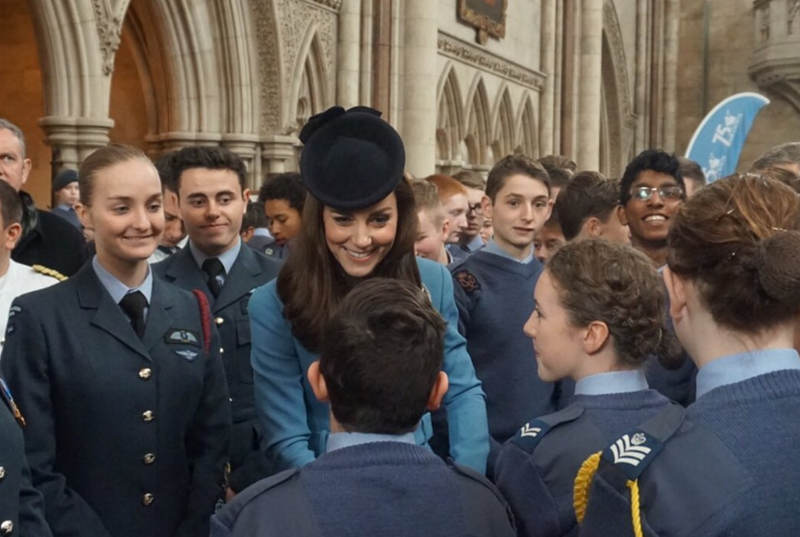 The Duchess now represents 42,000 air cadets aged from 12 to 19, and 15,000 adult volunteers at more than 1,200 units across the UK and overseas. This was Kate’s first formal engagement of 2016. As ever, the media presence was strong, as seen in this photo from WKW Facebook friend Amy Ward and her husband Joe. 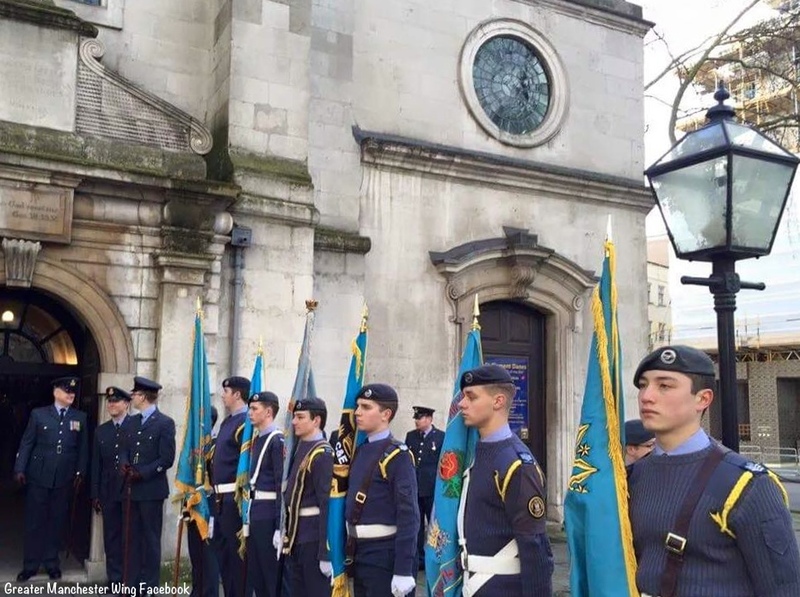 There were more than 500 Cadets at the church service. It was the official launch of events celebrating the group’s 75th anniversary. 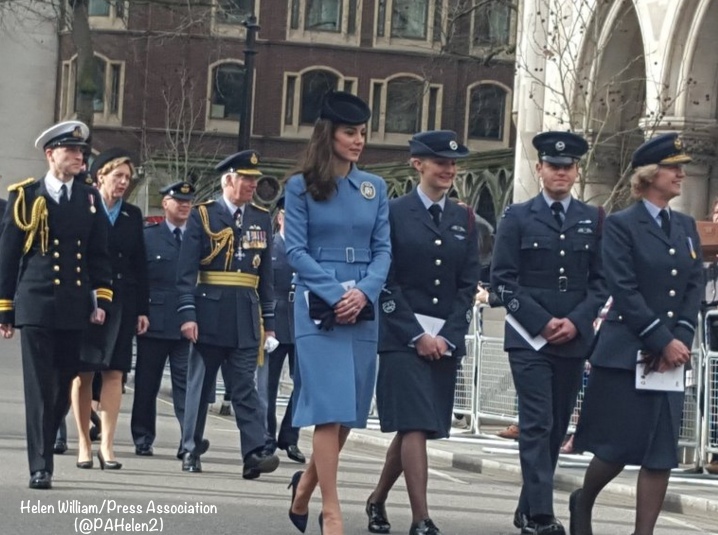 Carol Vorderman, a qualified pilot and an Ambassador for the RAF Air Cadets said the Duchess was ideal for the role. Her Husband is a pilot. Her brother-in-law is a pilot. Her father-in-law is a pilot. Her mum used to work in an airline. She obviously has a great appreciation of the military and enthusiasm for youth. Following the service there was a brief walk to a reception at the Royal Courts of Justice. You can just see a hint of what looks like a navy blue dress or skirt beneath the coat. Commodore McCafferty at the podium as the reception gets underway. 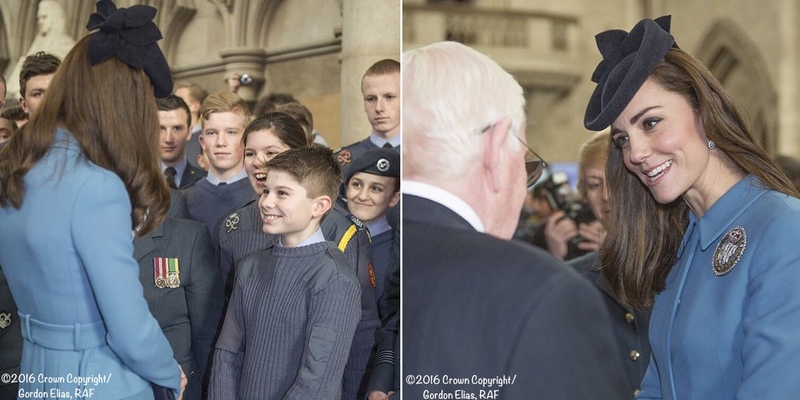 She seemed to revel in her time with both cadets and veterans. 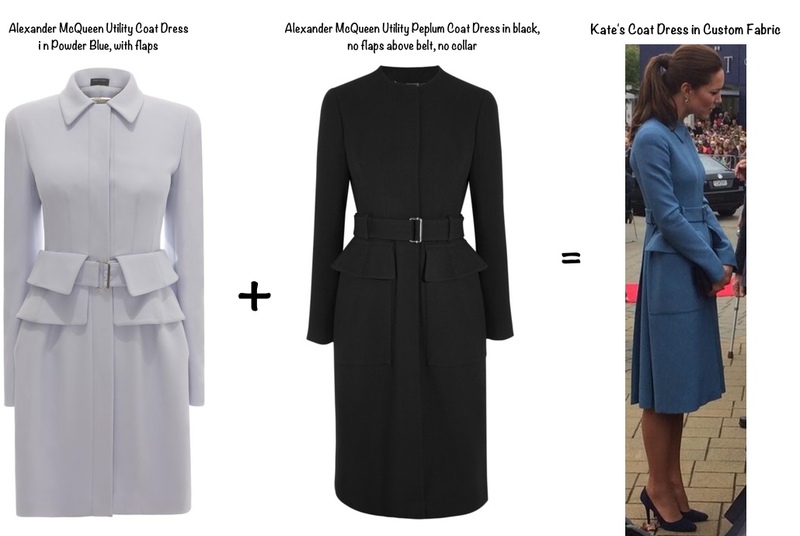 Moving to what Kate wore for today’s events, we look at the bespoke version of Alexander McQueen’s utility coat, a 2014 style. This is the first time we have taken a good look at the piece from the side and back. It is the third time we have seen the Duchess in the garment. Previously the piece was worn in May of 2014 at the Blenheim War Memorial in New Zealand, and then in June of that year for D-Day 70th anniversary events at Normandy. Below, a graphic created the first time the Duchess wore the piece. Of note: both garments shown in our graphic are labeled coat dresses by Alexander McQueen; Kate’s must have been cut a tiny bit roomier, allowing for a dress beneath the coat. There is more on the coat here in a post where we highlighted the piece prior to Kate wearing it, and here in the Blenheim Memorial post. 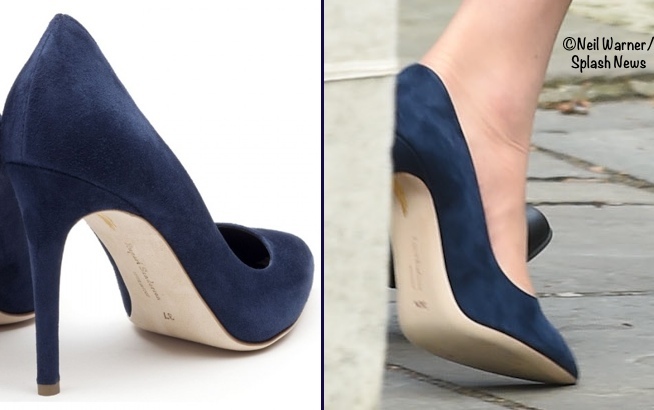 Kate was in a new pair of suede pumps today. We initially thought she was wearing another pair of Gianvito Rossi heels, but with thanks to a WKWer who does not wish to be credited for the tip, it looks like the Rupert Sanderson Malory in navy suede. It is the sole of the shoes that seems to prove the point. A perennial classic, Malory returns for the new season in opulent navy suede. Loved for a sultry 100mm heel and forever-chic pointed toe, this signature court will complement on-duty tailoring and occasion dresses alike. This marks a return to the designer for the Duchess, she previously wore the Rupert Sanderson ‘Malone’ at Order of the Garter events in June of 2011 and at Fortnum and Mason in 2012. We saw Kate’s Muse clutch again from Stuart Weitzman for Russell and Bromley. 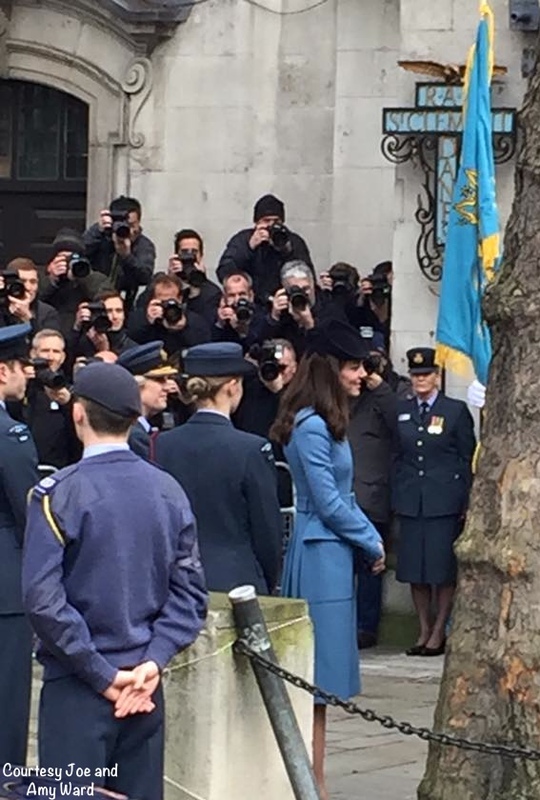 Kate might be carrying the Imogen in navy suede by Cornelia James. It’s not possible to say definitively one way or another if it is the Imogen, although we do know the Duchess does own them in navy. 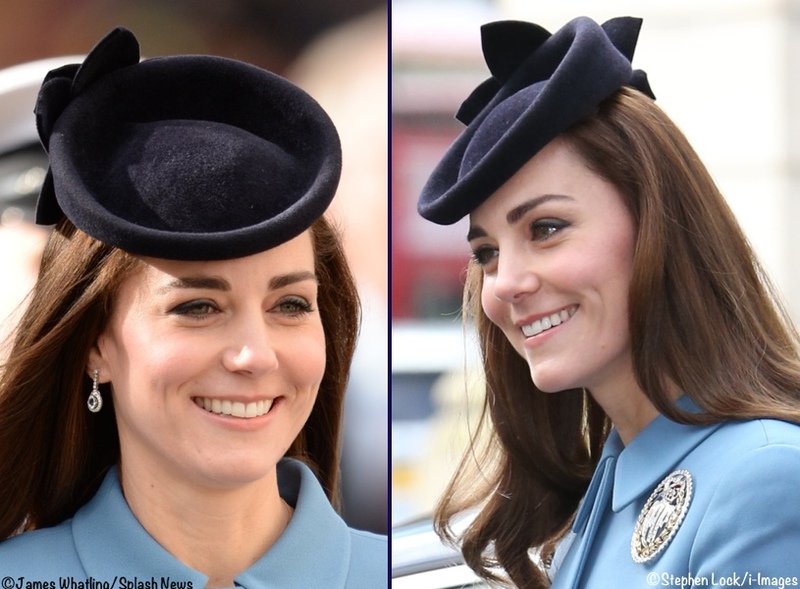 For jewelry the Duchess opted for diamond and aquamarine drop earrings that some may recognize from previous occasions, and a new jewelry piece, the Air Cadets Dacre brooch. 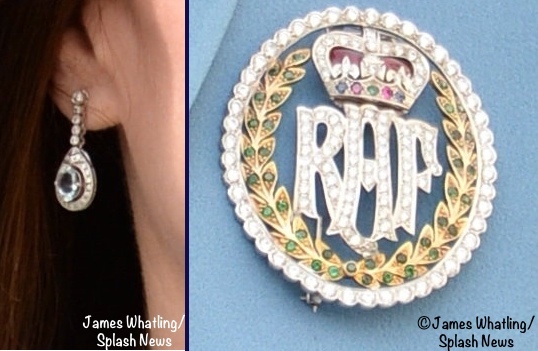 Below you see the earrings at Order of the Garter ceremonies in 2014 and a party for the Goring Hotel in March of last year. The brooch was given to the best female cadet from when they were first admitted in 1982 until last year, when it was agreed that they should receive a sword like the boys. In this photo from the PA’s Helen William you see Kate with Lucinda Conder, the Top Cadet for 2015 and the final winner of the brooch. 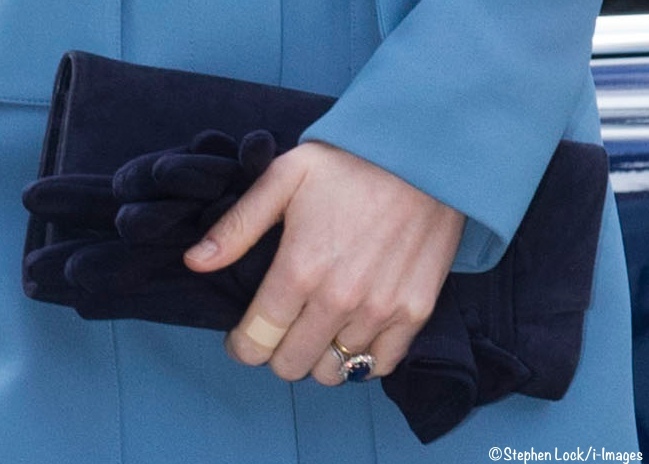 If speculating on what was happening when the photo was taken, I would guess perhaps the box is for the brooch and it is officially being passed on to the Duchess. Lucinda Conder, 19, said that the Duchess told her she had shown Prince George images of Spitfires following a Royal engagement which had fired his imagination. Below, the cake from today’s reception, the picture is via Cakes by Heather J’s Twitter account. 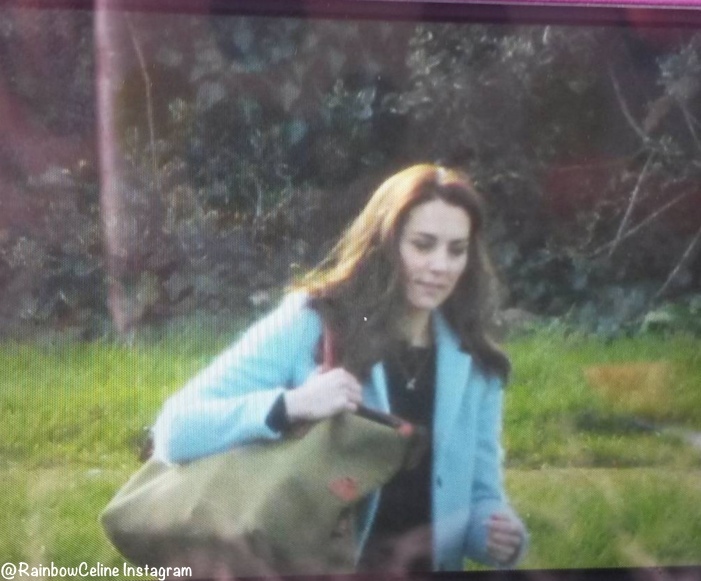 Here is a quick look at Kate in after today’s engagements, the picture was posted on Instagram by RainbowCeline. NOTE: Because this post has become so lengthy, I have created a new post that deals only with the Children’s Mental Health Week video and the new photo of Kate seen above, it contains info on the Mulberry coat she is seen wearing. If you refer to avoid lots of scrolling, all the info below is contained in the new post you can read here. Here is the Children’s Mental Health Week video in its entirety, it runs about 3:30. We also have brief news about the spring tour. The Times of India reports the Duke and Duchess *will* visit the Taj Mahal. An advance (team) from the British High Commission held a meeting with Agra officials on Thursday. It will be the first time after Lady Diana who visited 24 years ago that someone from the British royal family will be visiting the monument of love. A senior official said the team was here to review the security system in place at the monument. “The advance team did not disclose much information about the itinerary of the royal couple. Even the date of visit was not shared with us owing to the sensitivity of the matter,” added the official. A senior official said the team was here to review the security system in place at the monument. Kate’s next scheduled engagement is the guest editing function for the Huffington Post UK on February 17th. 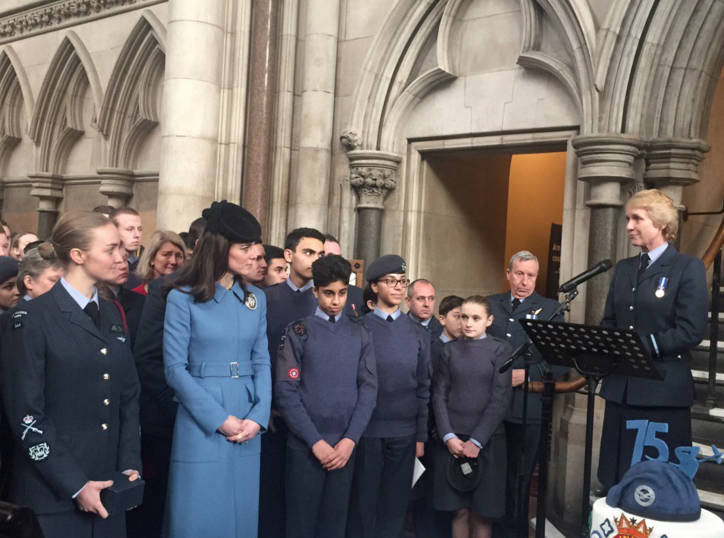 I really like that the Air Cadets marked their anniversary with a church service. This is one of my favorite coats of hers, always nice to see it out and about. I think calling for a makeup artist just to right a brow is excessive. She might be experimenting with a new look. Nothing as aging as a woman who does not change her look once in a while. Appropriate and elegant. Good to see the Duchess in clothing not easy to pick up. Do not ever remember Diana’s clothes sourced for the masses to replicate. They were her clothes. Signature pieces. Iconic pieces. Much like her hair. I think the Duchess is still recovering her own hair. It doesn’t have the wow factor back yet. I wonder why she has it so dark these days. I found a colour and cut years ago that suited me. I do not experiment and ignore trends. 2011 was her best hair year. Not a great hat either. It was ageing. Saw a piece on her ever changing brows. It was remarkable their impact. Never noticed before. Her new shoes beautiful. Suit her perfectly. I note the ad for corkscrew wedges to my right and wonder at the fact Kate has abandoned this style in favour of the sort she wore today. Maybe she’s saving all new outfits for her trip to India?? The McQueen blue coat is perfect for the occasion, and that gorgeous brooch adds a special touch! I would love to see the duchess a little more experimental. I find today’s look (hair and hat) rather boring and wish she would add a subtle modern and stylish touch like Mary of Denmark. I wonder if the dress under the coat is her “Manon” Fitted Sheath by Roland Mouret. That time when you left the house with only one eyebrow penciled in…..Oh dear, poor Kate. I really wish she’d just tone down the eye makeup and/or get a makeup professional to help her. The coat is beautiful on her, it’s a nice color for her. I thought her eyebrows looked odd, too! I just noticed it. One.of those eyebrows is definitely not like the other! I’m so glad that someone else mentioned the eyebrow issue, I was beginning to think I was seeing things, and then I read the DM link. It’s not a good look on her, I do wish she would use a professional make-up artist, I don’t think this is one of Catherine’s strong points – doing your own. Another thing I can’t help but notice is, how much she has aged in just two years if you compare 2014 to ’16 pics as are often shown here to compare former wearing of outfits. I know she’s had two children, but it’s not like she looks after them on her own, she has help. Her lovely dewy fresh face has gone flat and dull. Any reason to have a pro artist. Thanks for the Royal Hats blog mention, I’ve never seen that blog before but I’m glad to know about it now! As for the aging, I agree with you. I really think it is all due to her makeup. She just seems to be wearing more of it lately and the heavy eyes and at times heavy blush do age her. I think underneath it all she is likely just as dewy as ever. I would bet good money that the 2016 photo shown in the link above has been photoshopped. They are trying to make a point, and yes, Kate’s makeup is not up to Hollywood standards, but it is not as bad as they are making out. I for one am glad she is not going for a completely airbrushed look. Not a huge fan of the color of the coat, but do like the coat in general. I once had to wear a bridesmaid dress in that same color – it washes you out no matter what your skin tone is. If Kate had this coat in Navy, or even in Red or Purple, it would look so much better. Loving the new shoes, and that brooch is stunning! I have always liked the Rebecca Taylor skirt suit,b/c its a modern twist on the classic skirt suit.One of my all time favorite outfits from her. 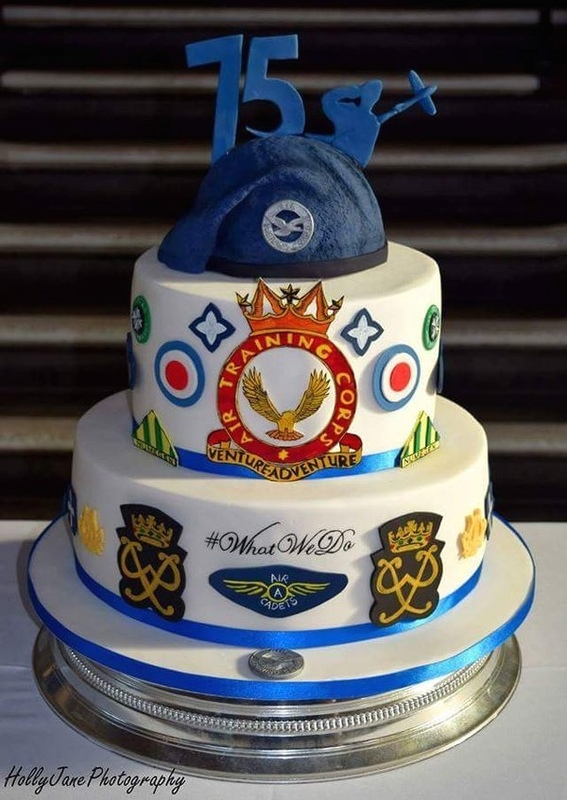 P.S:I’m not a fan of the RAF brooch,because it looks rather tacky to me. I feel that Catherine’s coat would of looked better if the pockets had been removed when it was made, overall though, I do like the coat, and felt the colouring fitted the occasion. An outfit she has worn in recent times that I’ve actually liked. I liked her hat and especially her shoes, but then I do love high heels – if they are not mega expensive, I’ll be on the hunt for them to purchase, I especially like the shade she worn when she visited Fortnum’s. I do think that in the near future, Catherine is going to have to start wearing her hair in a different style when she is on civic duties. Don’t get me wrong, I love Kate’s hair, but certain outfits and occasions need a hairstyle where the hair is not all over the place. I did like the ponytail in the ’14 photo. Is it just me, or does anybody else think that Catherine’s eyebrows look darker and fuller than normal, as if she has been using more eyebrow pencil or has had them tattoed? I love the outfit in the video. I think we have seen it before??? Anyone know for sure? It’s her Rebecca Taylor tweed suit. We’ve seen it a few times. To save you combing through for the links, here they are! Love the coat, shoes and hat but her hair styled like this (or unstyled as someone suggested) really distracts from the entire outfit. The detailing of the back of the coat is wonderful. I wonder how long it is going to be before Kate realizes she must do something more with her hair in the public outings. She has beautiful hair, but hanging down like this just isn’t regal or professional looking. I agree regarding her hair. I think the way her hair used to be when it was longer and sans fringe could hold its own without being pulled back at all, but somehow the length or cut it is now doesn’t have the same finished look to it. Looking at the June 2014 picture, just that little extra effort of it pulled back a bit at the top really changes the look (for the better). 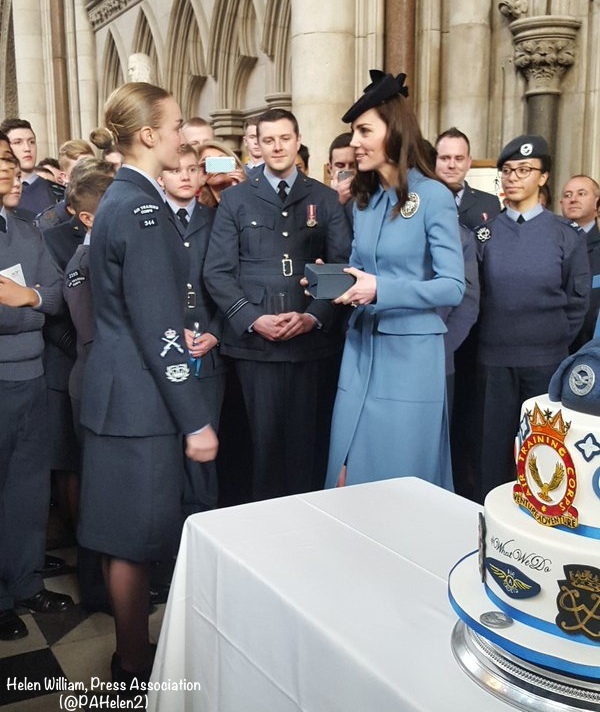 For a split-second, I thought the cake said #WhatKateWore !! That would have been weird though. 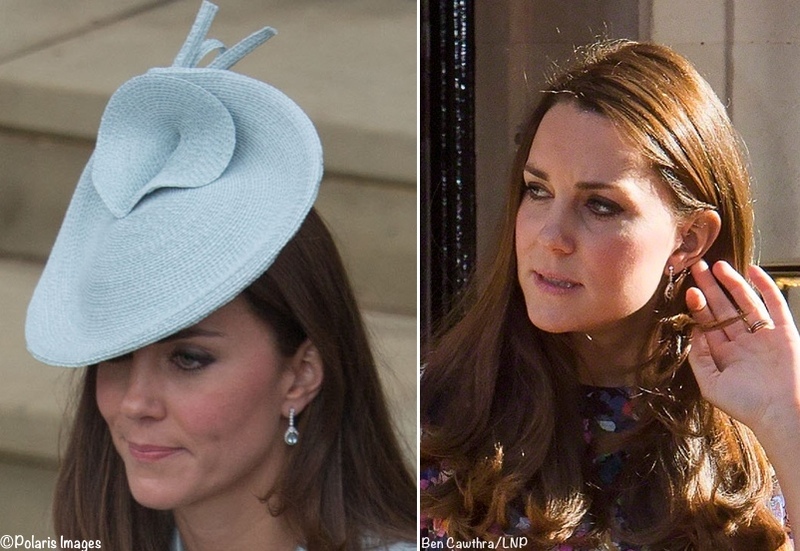 I’d like to see a little bit more detail about the hats Kate wears. I’m not sure how widely available that info is, but I’m very interested! Love the blog, Susan – thanks for all the hard work and beautiful coverage! I’m still not wild about this coat, which continues to suggest to me a uniform item worn by characters in some drab dystopian film. Part of the problem is the color, quite like that of the hospital scrubs worn by the staff of one of my doctors. (He wears them, too, rather to my dismay.) I can’t help imagining this coat on legions of workers in some futurian clinic devoted to genetic engineering or something. However, I believe I commented on the coat’s second outing that the proportions worked better with the Duchess’s hair down and with a hat. Somehow, it had seemed ill-fitting, engulfingly overlarge, when she wore her hair sleek back in a ponytail. The look is equally better-thought-out on this third appearance, and of course the coat is entirely appropriate for the engagement. I can’t argue with her choice. It’s very nice to see a good back view. This is one coat that looks far better to me from the rear than from the front. I am fascinated by her hosiery… what are the chances any of you know if she wears stockings… I can never get mine to look as natural as hers do… They always look like wrinkled elephant ankles around the shoes and the color is always off… Thoughts?? ideas? On the basis that the Palace would never ever disclose the Royal Family’s hosiery, I would imagine that she wears Wolford, probably in a 8, 9 or 10 denier, it could even be the Ultra 5. I love that you would know that. I am positive the Palace would not comment on the hosiery – but how awesome that you can point in the right direction. Cheers to you! This is a great coat, and the slight military vibe is just perfect for the occasion. I’m not so sure about the hat though – or maybe it’s the loose hair that’s not quite right? Would a low bun have been too regimental? I can’t quite put my finger on it. Anyway, she looks great, and it’s lovely to see her out and about again. Can’t wait for the tour! I like everything except her hair. She needs to change her hairstylist. I think she is growing it out again. Mine is very similar and it’s an awkward length – not long enough for many layers but not short enough to look well styled and polished when down. It’s an in-between drab look for sure. I think the outfit was a perfect match for the occasion. She blended in by wearing blue but stood out by wearing a different shade. I like the longer hem because it’s reminiscent of the era in which the Air Cadets was founded. She seems to like history and the history of fashion. The earrings look like aquamarine to me. Maybe that will help with ID? Oh, you got a back view – thank you so much! I was looking all over for one of these. The McQueen tailoring on this coat fascinates me, there are some lovely close-ups of the seaming and the top of the back pleats. For a potentially stiff formal coat it has a wonderful fit and fluidity and must be a joy to wear. The signature McQueen military touches chime perfectly with a royal lifetime of military engagements while retaining a feminine touch. The back pleating is fine enough to be on a skirt. The main drawback to me is the flat colour tone of the colour although it is clearly spot-on against air force uniforms. So I welcome the dark accessories which give some relief. I think the coat looks much better worn with a hat, I found the sleeked back ponytail a touch severe. 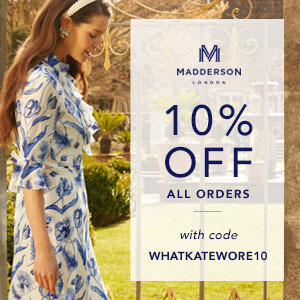 Those Sanderson shoes are to die for. I also harbour a minor quibble about Kate’s adding the collar to the neckline which I feel would be better left plain as per designer, there already being a wealth of tailoring detail throughout. Overall, it’s a highly appropriate royal outfit and Kate is canny to collect such classy workwear items. Btw, I love the gif! I have never been a fan of this particular coat on the Duchess. It may be those large pockets in front, as mentioned in an earlier post from today, that simply overwhelm her small frame. The color is beautiful, but I’m distracted by the dark hat and shoes. Couldn’t there have been a hat in a matching shade, at least? I agree the color of the coat is beautiful, gorgeous actually, but the coat’s large pockets are very unflattering to Kate’s lovely figure. Love this coat. That brooch is GEORGEOUS. So glad to see her starting to wear them, I often feel like her coats are lacking them, and this is a massive addition to her jewel collection. Yippie!! Any more info on the hat? Name etc? She looks just right, refreshed and friendly. I think it is a great coat as well, and was happy to see it again. But, I love the collar, the belt, the color, the length. I LOVE all the pleats in the back. It looks so feminine! I love that the material is lighter/thinner. So often her coats look so bulky and thick (they are coats after all!). 🙂 But because of the thin fabric and the way this coat moves, this almost feels more like a coat dress to me. Meh on the hair/hat. But overall, I really liked how she looked today. Even the heels that are a darker shade of blue and an interesting fabric – I love it! The coat itself is fine,but on the Duchess its a little shapeless.I really like its color though. I love this outfit (coat and hat) on Kate. I do think a pump with a thicker heel would have balanced the look better and I believe she already owns a pair. I would also not have gone with such a delicate earring. Still my least favorite coat. With the extended length it just lacks fluidity and does not do her slender, tall frame any justice. From the back, the pleating saves itself. I realize protocol commands her knees be covered at some events, just the wrong style to extend the length on her. I agree about the length. An inch shorter with a different shoe would make all the difference.